Only three miles & it’s on a lift! – Bradenton, FL – RV Cheaper! November 28, 2012 January 8, 2015 RV Cheaper! 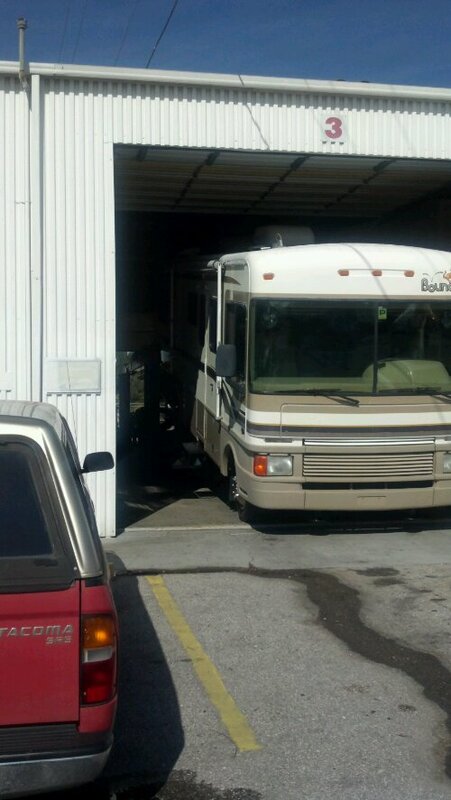 Even though we purchased the RV “as-is”, Rick offered to have the dealership pay for half of the jack repair since he wished he had checked the back and not only the front jacks. The spring that was removed was the wrong one and covered up the original spring that was broken and still firmly attached. There’s no way the dealer could have caught this during the inspection, so I was really happy they helped us out so much, so soon and covered half the cost. The RV Shop had to put the Bounder on a lift to completely remove the rear jack assembly so they could remove the original spring stub. While I was at the RV shop, Alice was stuck at the mattress store and the salesman got to hear about some of this crazy story I’ve gotten us into! Previous That left a mark!